The Magpie's Nest...: Here's a serious question: why is Craig Wallace trying to throw this election? Here's a serious question: why is Craig Wallace trying to throw this election? Now this isn't a question from an educated posterior - an anatomical anomaly often referred to by those who communicate with the old bird by the somewhat terser term 'smart arse ' - no, it is a fair dinkum question for which a very strong case can be mounted. Which The Magpie will shortly do. This issue also raised a couple of related questions about interconnected matters, like Queensland Health. A couple of new words entered the Magpie lexicon during the week, and most apt and timely they were, along with the saying of the week, from the American Republicans campaign to find a challenger for Bazza Obama. 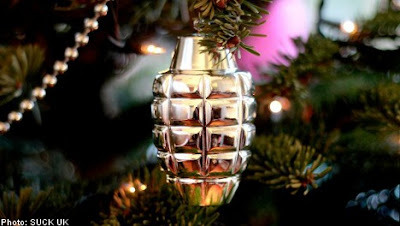 Also, over in Scandanavia, recently most famous for creating a deranged psycopathic killer of holidaying children, one very respectable Swedish group wants this Christmas to be a real blast ... they are selling - for charity - Christmas tree ornaments shaped like hand grenades. The 'Pie has a pretty pic to prove it. And just to lighten up a bit, the biting wit of a British politician at his slice and dice best when putting those European foreigner chappies in their place. First, because of what follows, it might first be best to to look at the inventivness of English. A new word floated into the nest this week, that being 'ineptocracy' - which speaks for itself. And a pissed off blogger (so angry, these blogging buggers, aren't they?) referred to the knee-jerk, party-committed voters as 'sheeple' - neat. Then there was the American Republican fruitcake - but The 'Pie repeats himself - Christine O'Donnell, who was whisked off the Senate selection scene when she revealed she might have been a witch. Now, she has given support to that bible-basher Mitt Romney - who has reversed his position on several issues - with the timeless endorsement ' I so admire Mitt's consistency since he changed his mind'. Ummm ... oh, never mind. But closer to home, consistency and changing of the mind has some darker implications - none of them to do with winning. Could there be a method in the madness of Craig Cuddlepie Wallace's increasingly bizarre behaviour and pronouncements? Is his latest middle finger to his electorate part of a cunning personal financial plan? Is it, in fact, all just a big fat Cuddlepie con? Not that fat is an adjective that can apply to Cuddlepie nowadays, our man appears to have lost the best part of 25/30kgs. Is this because of his anguish and concern at neglecting and spurning his electorate, or just another clue to his future, as he slims down for a sleek corporate look more befitting the free market world? He has certainly shed the sloth-like appearance that so befits his performance as both a minister and one of the MPs responsible for Townsville's interests. He almost out-Snoozed Snooze in terms of total disregard for active representation of, or engagement with, his constituents, although he at least didn't go in for the preening self-regard of the former Speaker. Here's how The 'Pie sees it. The very first inkling of a proactive 'the hell with it ... and you' attitude so reminiscent of Capt Snooze came earlier this year when Minister Wallace tried to defend the indefensible and ended up with the Steggles Golden Egg Cup for the year's best egg-on-face performance. (Such honour in a greatly crowded field ... Typo will be so upset). You may remember, when the floods devastated southern parts of the state, and Premier Blight said she and her team had combed through budgetary items for money that could be diverted to urgently help flood victims. Indisputably a worthy cause, but in a reality-defying decision, one item which Cuddlepie wholeheartedly endorsed was cutting funding previously earmarked to flood-proof crucial bits of the Bruce Highway (apparently, it never occurred to anyone to drop funding for the odd Brisbane footy stadium or Gold Coast SuperPest race). When questioned about this bizarre reasoning on local ABC radio, Cuddlepie flew into a barely supressed rage, blustering on about the plight of the poor flood victims and that 'these bloody people need help' or some such, then topped off this little verbal confection with a bitter cherry when he suggested that people up thisaway - ie those who elected him to look after their interests - were selfish and heartless. In just a few words, Cuddlepie managed what few before him had achieved - to rightly point out that as minister he has to act for all the state, that dopey decisions like this funding cut didn't have to be explained, and giving his electorate a swift lifted-knee to what cricket commentators refer to as 'the groin area'. Our man was left looking like a rolled gold, Exhibit A prize goof when within a week, Yasi arrived and promptly cut the Bruce Highway in more than 30 places. But was this just the start of a planned program of coming on like he was a victim of slow-onset dementia? A couple of times, his parliamentary performance was so embarrassing that even Premier Blight was mumbling to herself while gazing at the ceiling. There was an almost incoherent rant about a dinner someone had with Campbell Newman, then the dumbfounding 'singing answer' in question time, when the Minister for Mean Roads ignored a perfectly reasonable question and chose instead to do his version of the hokey-pokey, fibbing about the opposition's supposed politically suicidal plan to toll the Bruce Highway (he knew he was fibbing, and was later forced to publicly admit it). And now, we have the even more mysterious matter regarding the state funding its share of the proposed new Townsville Entertainment Centre. Now look, this really has to be a first in political nighty-ripping, schoolyard spite from a party and MPs who know they'll be either turfed out, or be in opposition next year. Which gives us another clue to Cuddlepie's hidden agenda. In an amazing and hardly coincidental performance this week, all three of our local MPs turned on their own electorate, repudiating - one and all - their purpose and pay packets with the most asinine and snide 'decision not to make a decision' over the state government's share of the three way funding of the proposed Entertainment Centre. As if ever you needed proof, they really do know they're on the way out. At the party's direction, our three mousekateers all supported the call for an expensive $200,000 feasibility business study to see if the planned entertainment complex was viable - although a comprehensive plan had already been done and submitted to the government many months ago. And demanded that the ratepayers pony up half - $100,000 - of this grossly inflated sum. Funny, y'know, that previous study had been readily accepted by the federal government, which quickly agreed to its share. Leaving aside just why a fresh study would cost $200,000 - that's a hell of a lot of jawboning and doodling on the telephone message pad - Cuddlepie, along with the mercifully retiring Lindy Fly In Fly Out Nelson-Carr and the social-working sock puppet Mandy The Party Parrot Johnstone condemned the council for putting up what might be an 'unviable' project. 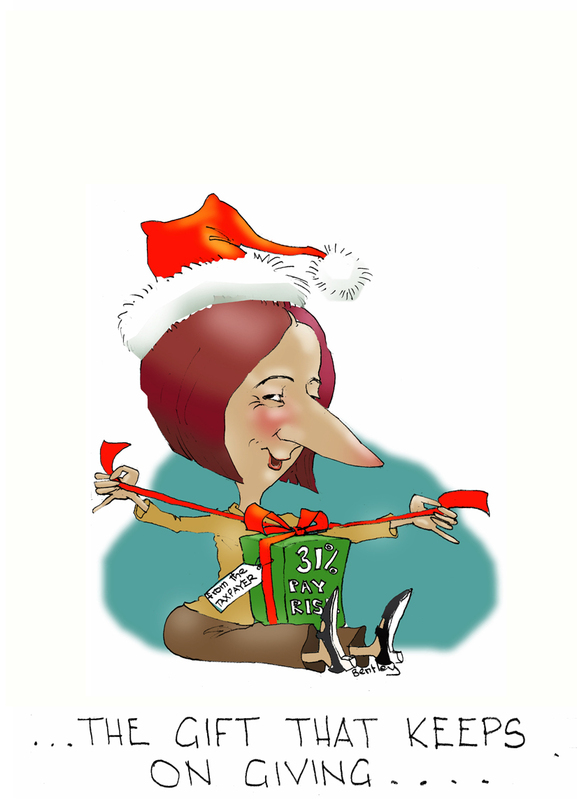 God, ain't it great to have your pollies on your side? Especially when they are happy to sock their own people another $100,000 to prove what has already been proved a winner, all under the spurious and oxymoronic guise of protecting the ratepayers. The new study would not be ready before mid-2012. When it will all be academic to Labor. This is an absolute doozy from these three stagers - maybe that should be stooges - one who doesn't count (Fifo), one who doesn't know (The Parrot) and one who doesn't care - guess who? In the last instance, let's ask just why Cuddlepie doesn't give a toss, with an election just months or maybe even weeks away, when fawning, dishonest brown-nosing and outright lying (from both sides) is more the time-honored norm? Well, here's The Magpie's theory. The numbers are approximate and sort of rounded out, but the principle is clear. Scenario one: Cuddlepie gets up against all the latest polling predictions, and so does the Blight Government, (yeah, right) and he and they get back into office. Probability: surely you jest - but if so, his income and benefits continue uninterrupted. Scenario two: Cuddlepie is returned but Labor loses to the LNP and he becomes a backbencher in opposition, or perhaps in shadow cabinet, which is no sure thing (Blight hates him and his track record is abysmal). Probability: quite possible if he does nothing to alienate the electorate, demonstrates mature leadership (lucky he's not standing in Gladstone) and uses all his reputed political nous to defeat tyro challenger Sam Cox. If this happens, he would be on the reduced pay of somewhere around $130,000. Scenario three: This is obviously Cuddlepie's preferred outcome - he loses, retires from politics, and picks up - for life as a former minister of two terms - his retirement package of about $140,000 a year. He would also be free to use his skills in the Chinese language to find a nice little earner in that field. Probability: highly likely given his 2011 antics - and absolutely certain if he continues to give a belligerent finger to the electorate. So you see, from the financial point of view, our Home Hill hellraiser would be a chump to try and win this election - he makes more by not even getting out of bed than continuing, in any capacity, as MP for Thuringowa - especially as an MP in opposition. Watch his performance closely, it will be top entertainment on a level with the dancing bears of medieval times. Our resident doodler, Bentley, fresh back from an exhausting cruise where he and the missus wisely viewed New Zuland mainly from a safe distance off-shore, seems to think money is ever present on pollies minds. What a cynic - and how good to have him back. In a strangely related matter, that squeaking sound of rusty hinges as galloping hoof beats recede into the distance is the stable door being closed long after the Queensland Health horse has bolted. But, hey, no wobbles, easily fixed, we are assured by Premier Blight, the chronic problems that have been allowed to develop in the billion dollar health bureaucracy over 20 years will be fixed up lickety split. How come that task can be achieved in 35 days, but - by comparison - a pissy little business study about the viability of an entertainment centre in Townsville will take 6 months, especially when it's already been done? And at $200,000 smackeroonies? Come on, premier, me old luv, give it away, take Cuddlepie's lead. Oh, what's that, you already have? Oh, sorry, silly old Magpie. Moving on, and by great contrast, now for a little political brilliance, for which of course we have to look beyond our shores, to that other three-ring-circus, the European Union. Daniel Hannan, the pommy MP there to represent his bruvvers across the channel, turned in one of the greatest displays of verbal shafting in a long time. The 'Pie knows that many of you don't click onwards to links , but he implores you to do so here, for one of the cleverest skewerings of European pomposity yet - a clue is that the European Union (EU) wants to a new division called the Fiscal Union (FU). Look and laugh - and then cry at the truth of it all. Then there are the Swedes, some of whom are really acting like the vegetable for whom they're named. The Swedish Army Museum has decided to raise money for charity by selling Christmas tree ornaments shaped like hand grenades. A new twist on Rolf's Six White Boomers, maybe? Enough now, it is away to Posuers' Bar, where the old bird will bebubble a suitable companion to whom he will only admit defeat when later asked 'Do you give up now?' and then perhaps, things will go bang in the night. eh? You still banging in the night? That link was maybe one of the funniest things in politics... Oh wait, no, Cuddlepie's rant was way better... Thanks for the laugh old boy. 'Pie, Love your blog, and in particular, the comment from MP Daniel Hannan. I'm glad I clicked on it. Happy Boxing Day and Happy New Years. Gonzo. Just silly stuff for the silly season.